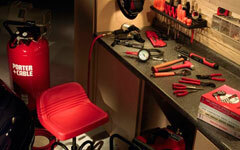 With so many tools, books, and other products out there, how do you know which is the best for your garage? Our experts have taken the time to review them for you. 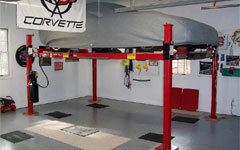 So if you’re wondering which floor jack works best or what type of pool table you should buy, we can help you select the functional and recreational products that will make your garage an Ultimate Garage. Backyard Buddy sells a robust free-standing lift that lifted our test car from floor level to 63-inches high in just 45 seconds using a 240-volt power supply. 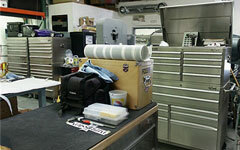 For garage duty, Slide-Lok modular cabinets are now the standard. Griot's sells two lights that we think work better than anything on the market. Each time you open and close this handmade tool chest, the drawers slide like the con rods on your Duesenberg. 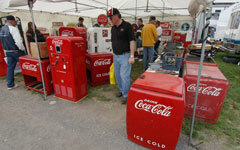 Annually, Carlisle, Pennsylvania's 82 acres of fairgrounds lay out a spread of car parts and petrobilia that draws a national crowd of 200,000.